The Foreign Policy associate editor questions the list of most powerful people in which Russian President Vladimir Putin takes top positions. A blogger from Foreign Policy has named Putin as the most powerful person in the world. While the Foreign Policy associate editor questions the list of most powerful people, Russian pundits try to account for the Russian president's positions in the dubious ranking. An article in leading U.S. magazine Foreign Policy has named Putin as the most powerful person in the world, although the top spot left empty. He based the ranking on "a quick, informal survey around Eurasia Group on power and global politics." “The leaders you'll see named further down this list are preoccupied with local and regional problems and don't have the interest and leverage needed to take on a growing list of transnational problems,” he wrote. After the top spot's empty chair, Putin comes in second. The Russian president is followed by U.S. Federal Reserve chairman Ben Bernanke, who is ranked third, German Chancellor Angela Merkel (4) and U.S. President Barack Obama in fifth place. Then come European Central Bank head Mario Draghi (6), Chinese Communist Party Secretary General Xi Jinping (7), Iran’s Supreme Leader Ayatollah Ali Khamenei (8), International Monetary Fund chief Christine Lagarde (also 8) and Saudi King Abdullah Bin Abd al-Aziz (10). This article has been widely reported in the Russian media as being a Foreign Policy ranking that names Putin as "the most influential person in the world," although the article itself makes no such claim. Joshua Keating, editor of Foreign Policy magazine, says in his article appearing on the magazine's website that Bremmer's post, which created a buzz in Russia's media, does not reflect the real position of the publication. "It wasn't Foreign Policy, but one FP blogger; it's not an annual feature, and the item did not appear in the print magazine," Keating said. While talking about Russian media's coverage, Keating noted that Russian journalists "leave out Bremmer's not-so-flattering reason for putting Putin on the list." "ForeignPolicy.com is getting a little more .ru traffic today, since the Russian media seems to have picked up on Ian Bremmer's list of the world's most powerful people," said Keating. Still, some Russian pundits argue that Putin's leading position in the Foreign Policy blog indicates that the West lacks political leaders who can tackle the current economic and political problems. 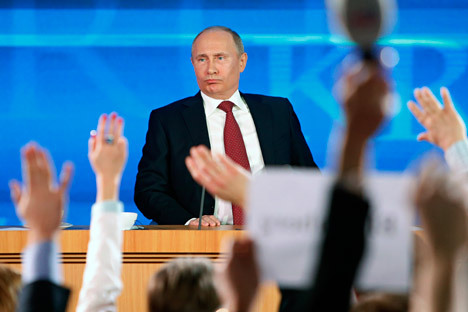 President of National Strategy Institute, Mikhail Remizov, believes that Putin overshadows other political leaders because he has been enjoying much more power for a longer period of time – and both Russian and Western experts make no bones about this, he added. Another reason of Putin's high entry on the Foreign Policy blog ranking is the lack of bright, strong and extraordinary leaders in the West. "There are no high-profile leaders on the global arena now like those who lived in the second half of the 20th century," Remizov told RIA Novosti. "And among modern politicians, Putin looks like a reminder about hefty leaders who lived in the 20th century." Likewise, Russian political expert Dmitry Badovsky argues that the Foreign Policy blogger decided to leave the top spot vacant just to point out to the leadership crisis in the West. In addition, Badovsky mentioned Putin's victory in the 2012 presidential election and his attempts to flex Russia's muscles on the international arena. "Putin's return to the position of the Russian president and his project of creating of the Eurasian Union are among the most important trends in the geopolitics of 2012," Badovsky said. The article is based on materials from RIA Novosti and the Foreign Policy magazine.